We’ll be doing a free webinar with MB Trading tonight Tuesday, September 28th at 8PM ET. You’ll see some real life examples of how traders like you have been able to improve their trading and become more consistent in the markets. No matter what type of trading you do, you’ll be able to leave the webinar with some concrete information that you can apply to your own trading. This webinar promises to be well worth your time. Signup now. We’ve recently added support for over 27 Forex currency pairs on StockTickr. So if you trade Forex then you can now use StockTickr to track your performance and become a better trader. Sign up now and take a free trial. Learn more about improving your trading with StockTickr in a free webinar scheduled for next Tuesday, September 28th at 8PM ET. The webinar is sponsored by MB Trading. You can sign up here. Trade Charting – Analyze your trades on charts with your entry, exit, and stop price automatically plotted right on the chart allowing you to quickly review dozens of trades by flipping through charts and identifying new patterns. Dozens of Reports – Access to easy to use reports that show how you can take your trading to the next level, for example by changing how you take profits or manage stops. Backtesting – Run simulations and what-if scenarios to see how you can improve your trading. Use the backtester to help you answer questions such as: would you be better of scaling out of trades? Or, would you be better off using a target across your trades? Categorize with Tags – Use tags to classify your trades and view reports and charts for subsets of your trades. Now you can easily see performance across different types of strategies you are trading and identify the most promising ones. Automated Trading, Graphs, and much, much more. As I’ve increased my trading size over the years, I’ve thought more about money management and the best way to approach it. You can make money management as complicated an issue as you want to, but as with most aspects of trading, simpler is often better. How much am I willing to lose in a single day? That’s really what it boils down to. You are going to have to tolerate big down days to have the big up days so the question really is how much heat are you able and willing to bear to ensure that you catch the profitable days? If you don’t have a good idea about how much it’s possible for you to lose in whatever timeframe you’re trading in, then you should probably do a little more research until you have that answer. That’s because one day you will lose that much money (and maybe more with slippage) and when the next trade comes along it’s easy to second guess yourself and screw something up. We’ve put the finishing touches on the latest version of the StockTickr Trading Robot. You can use it to automatically trade your Trade-Ideas strategies through your Interactive Brokers account. Here’s an overview of the new features – they open up a whole new world of strategies. We’ll be posting a series of posts over the next few days going into detail about some of the new features. Limit Entry Based on % of Spread – place your limit entry order based on a percent of the spread – great for strategies that trade large spreads. Real-Time Buying Power Awareness – shows up to date buying power in your account and monitors to skip orders that would be rejected due to running out of buying power. Relative Orders – option to use relative orders to enter a position. Also known as “Pegged-to-Primary”, this server held order automatically updates based on the bid/ask. See more details on the relative order. Market If Touched Orders – slightly different than a limit order, the market if touched order turns into a market order if a certain price threshold is met. See more details on the market-if-touched order. If you’re ready to take your trading to the next level, go grab the robot and introduce some automation into your strategies. Most traders, from beginners to professionals, know that keeping a trading journal is an important aspect of trading as a serious endeavor or career. Keeping a trading journal however takes effort and is all too easy to just brush aside and ignore while focusing on other areas in your trading. In this list I offer some key reasons I use to remind myself why maintaining a trading journal is worth the effort. Accountability – when you keep track of your trades diligently, noting what reasons you had for taking them and how they turned out helps keep you accountable to the trades you’re taking as well as how you’re managing them. A finger on performance – understanding how your methodology performs and monitoring its expectancy, win rates, and other parameters such as average winners and losers size can help tell you when things are either working really well and you should press your edge or when markets conditioned changed and you need to scale down or re-evaluate your edge. 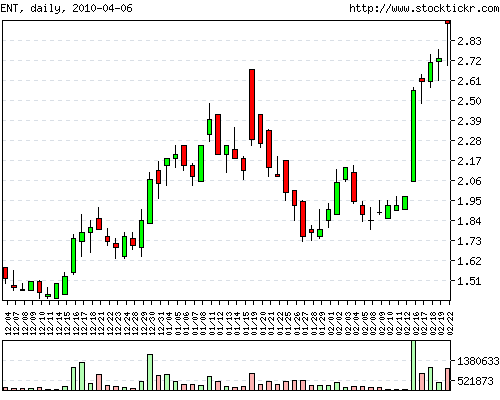 Research tool – A trading journal can also be an excellent research tool that helps you improve your edge. This can be achieved in several ways, one of them is when you tag your trades and keep track of different variables like market sentiment, candles formations, your own state of mind, or any other variable you can then look for relationships between your performance and those variables. There are many times where I’ve discovered that some trades should be skipped and others traded with larger size as a result of researching my trading journal. Self coaching – Aside from analyzing performance and quantitative data you may also want to keep track of your overall development progress as a trader, what habits are you trying to change, what goals are you setting for yourself and how are you doing in terms of achieving them. Without monitoring and tracking it becomes difficult to keep focus on those goals and all too easy to slip into bad habits again. Keeping things in perspective – We’ve all been there, you’re having a really good week or a really bad week, the impact of this type of unusual performance can play havoc on our heads. It is human nature to put more weight on recent events than on statistics of the past 6 months or even years. A trading journal can help re-align our thoughts, expectations and overall mental state by showing us visually how the last bit of performance compares to our longer term track record. This list of points isn’t revolutionary, but revisiting it helps remind me of why I’m keeping a trading log and how it helped me improve my trading over the years. Hopefully others will find some of these points useful as well. As some of you have noticed I post my daily trading radar on Twitter each day that I trade. Since I started posting it I’ve gotten a lot of feedback and questions on how I generate my list and what exactly it is and how I use it. This post is an attempt to answer some of those questions. How is the list generated? I use two tools to generate my daily trading list. One is Trade-Ideas and their scanner product. I have a couple different scans that I use to identify candidates that I might trade. The other scanner I use is the scanner that is included in Interactive Broker’s Trader Workstation. I take the output from my scans and manually filter the list removing stocks that I know I will not trade (for example, buyouts often appear and have to be manually removed). How do you determine what goes on your trading radar? Through trading, backtesting, and using my trading journal I know what characteristics of stocks make it most likely for this particular trading system to be most profitable. Of course your mileage may vary. Are you looking long or short for the stocks on your radar? In general, I’m looking to trade with the trend. That is not always the case but mostly it is. So if a stock is gapping up I’d be looking long and if a stock is gapping down I’d be looking short. Do you trade everything on your radar? No, if a candidate produces a setup then I will trade it otherwise I won’t. Some days there are no setups and other days every stock will setup although both of those cases are pretty rare. How can I use the trading radar you generate each day? However you’d like. You are welcome to somehow include it in your routine or completely ignore it. If you do use it somehow, I’d love to hear about it. You can contact me on Twitter or here. Will you post which trades you actually took? No. It’s not that I care that much about telling people what trades I took, it’s that it would take too much time to post it. What time do you try to post the trading radar by? I usually try to post the list to Twitter by 9:50, sometimes sooner sometimes later. I might try to automate the postings at some point. It’s 9:55 and I don’t see the list yet. Are you there? Feel free to contact me or leave it in the comments below and I’ll answer it. We’ve recently removed the requirement that our automated trading robot users have to have purchased the Trade-Ideas Odds Maker. It is still highly recommended that you purchase and use the Odds Maker so you can backtest your ideas and easily compare trading results to your backtests. That said, we know there are traders out there who have already proven their system without using the Odds Maker and want to use the power and ease of Trade-Ideas and StockTickr to automatically trade their strategies and track their trading performance with the trading journal. Existing subscribers can download the robot here or you can try it for free by taking the trial. A while back I posed a question about following a trend or reverting to the mean – two well known strategies. Given a specific subset of stocks defined in the post would the edge be long or short? Weijei‘s comment was very close to correct. It turns out that there is a definite edge to the downside on stocks that have gapped up on heavy volume. If you buy at the open the following day and then hold until the next day’s open you’d end up with a win rate of 38% with total percent gain of -286%. However, if you sold short at the open and held until the next day’s open you’d end up with a win rate of 68% with a total percent gain of 899%. There’s no doubt at least in the short term that there is more of an edge with a reversion to mean strategy with these types of stocks. Here’s the same chart in ENT. 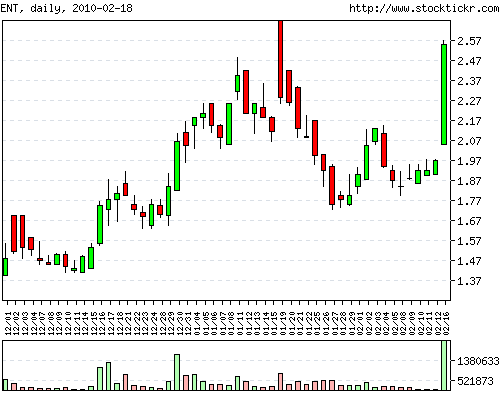 It shows that there would have been a small gain by shorting the following day. Look also at the days after – it looks like there might be a longer term trend following edge worth exploring. A few weeks ago I read Paul Kedrosky’s post on how contrarianism is a fad and how he thinks that most contrarians are just posing for the camera. Jason Goepfert wrote a nice rebuttal (with an eye-catching title) about how there’s good reason to be a contrarian in certain situations. He used an example of the S&P 500, but how would the strategy work for individual stocks? You rarely see the types of forceful moves in the overall market that you do in individual stocks almost every day. Surely these types of moves generate some follow through. So my question for you: Is there a trading edge on the long side or the short side after these types of moves? What’s your guess? Let me know in the comments below. « Should You Consider Re-Entering Trades That Have Stopped Out? TraderInterviews.com has a great interview with the Downtowntrader, Joey Fundora. He gives some very detailed information about exactly how he trades including his various strategies, the tools he uses to scans the market, and the trading journal he uses. Tim Bourquin is a masterful interviewer as always. Nice interview, Joey!